There are a lot of things I’m excited about when it comes to our very first Maker Faire Detroit, and this project is one of them. Jeannine Gruska will be setting up shop at the Henry Ford this weekend with her Pulr Street Scarf Project – a knitting initiative to make a scarf that not only fits the Thomas Edison statue inside Greenfield Village, but promotes how much fun knitting and crocheting is (but we didn’t need to be convinced of that, did we?!). I can only imagine how much yarn is used to keep Tommy Boy warm, but I have a feeling we’ll get a pretty good idea this weekend. 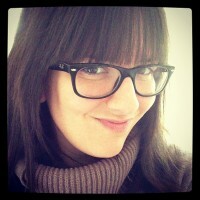 You can learn more about Jeannine’s project over on her blog. 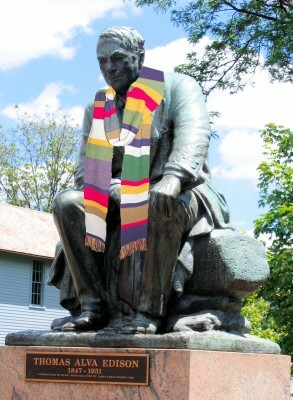 haha, My friend Julie and I were at Greenfield Village today and were lucky enough to get to see the scarf on Thomas!! He looked quite comfy with it draped about his shoulders, though it was a little long and had he tried to take a walk, would have surely tripped over it! !